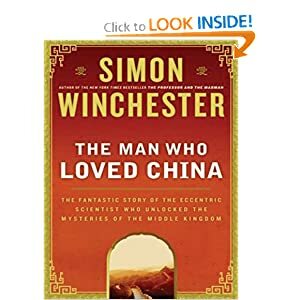 I am not interested in biography, but I approached this book due to the Needham question: why China was taken over by the west in science and technology around 1500 AD after the amazing advances in earlier times? I was hoping that this book will provide answers, even though I never realistically expected that since this is a question about history, and thus can never be verified scientifically. Well, I was right about that, as obviously nobody has ever managed to answer the Needham question. But that does not really bother me for several reasons. First, I, like many others who have been through both Chinese and American style educations, know the main reasons more or less, even though none of us can rigorously prove anything. But answering a historical question is not really the point. The point is to find remedies and solutions. That, fortunately, I, just like many others, already know how to do practically, as evident from our achievements in modern scientific and technological activities. Second, as pointed out in the book, the Needham question might be moot anyway, as China seems to have regained its rigor and creativity. But I cannot fully agree with this point; I agree that China has been improving, but it still has work to do to catch up with the American level creativity. Even from the young Chinese students I am collaborating today I can still see a lot of old problems that probably have been accumulated through hundreds if not thousands years of bad cultural impacts. But this is obviously fixable at least in an individual level; the million dollar question is whether it is also possible in a large national or even ethnic wise scale. The funny thing is that the Needham question was not formally addressed until at the epilogue of the book. So the book is really testing my patience. Fortunately, the main part of the book, essentially the biography of Joseph Needham, turns out to be a fascinating read. I recommend this book to anyone, especially (ethnic) Chinese working in the field of science and technology. Computer theory: A hundred page proof that takes many very smart people weeks or even months to verify and (eventually) reject. Computer graphics: A 4 to 8 page paper that takes one Joe Six Pack maybe just 3 seconds to reject because the teaser image does not look beautiful enough.
. Go to your google reader account, click on settings (reader settings), go to import/export, and export your subscriptions into an OPML file.
. Go to your viigo account, remove all existing channels of your google reader, and import the OPML file you just saved. This should just do it. I also think it is a good idea to save (and update) an OPML file for your google reader subscriptions, not just as a backup but also allows you the flexibility to switch easily to other readers. Recently I read about an interesting point, in the context of usury and debt interest payments under the Catholic and Sharia laws, that life is a loan from God and thus (just like all loans) will have to be repaid one day. I am not religious but I have found this an interesting mental exercise: if life is indeed a loan and one day we have to pay it back (to God) with principle plus interests, what the latter would be? In other words, what kinds of values do we have to add to our lives (for the sake of interest payments)? For simplicity, let us assume life is like a zero-coupon bond and everything is paid back in the end (of the life). On a further thought, I could be tricky to design such a social pass. If I just want to talk to people in the hallways, I actually do not have to pay a dime and just need to walk into the convention center. But then that might not be enough, as a lot of the conversations happen inside the sessions (especially at the beginnings and ends) and the parties (most of which, hosted by various companies and research groups, I could already go for free). So I still need the credential to attend a certain subset of full registration. Maybe one possibility is to charge for individual sessions so that I could pick only these that I plan to attend (to socialize). For the rest, I could simply loiter in the hallways and the parties. So it turns out that example-based texture synthesis has been deployed in Disney’s Tangled; for more details, see here (author’s site) and here (ACM DL). Anyone knows any other production scenarios please let me know. Anyone still questioning my emphasis and insistence on academic integrity (e.g. be honest in disclosing limitations and do not abuse authorship) please just take a look at this Economist article.